Insurance Claim Settlement Advice for El Paso County Homeowners as Residents & Insurance Adjusters Gain Access to the Burn Areas in Black Forest. June 21, 2013 – The 2013 Wildfire Season has already taken a devastating toll on Colorado residents, burning a record number of homes and personal property. 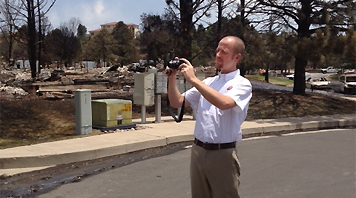 With the containment of the Black Forest Fire insurance adjusters are now on site inspecting properties and working with residents who will have questions about the claims settlement process. The claims will range from minor smoke damage to personal property, additional living expenses, vehicles and destroyed homes. "The 2013 Wildfire Season is yet another heartbreaking reminder to Coloradans that the wildfire threat is very real in our state and can exact a price that is both personally devastating and costly in terms of insurance damage," says Carole Walker, Executive Director of the Rocky Mountain Insurance Information Association. "Insurance catastrophe adjusters have been on the ground in our state since the fire started, and the industry is prepared to help impacted residents recover and communities rebuild. The industry has many resources available to help Coloradans work through the claims settlement process." Insured loss estimates for the Black Forest Fire will be compiled in the coming weeks as adjusters continue working with the hundreds of impacted homeowners. With next week being the one-year anniversary of the Waldo Canyon Fire, previously Colorado's most devastating and costly wildfire, there is at least hope for homeowners who are just beginning the road to recovery. RMIIA has updated insured damage estimates for both the Waldo Canyon and High Park Fires which now stand at a combined total of $567.4 million from approximately 7,941 homeowner and auto claims (previous combined insured losses: $449.7 million). The Waldo Canyon Fire is currently Colorado's most expensive wildfire with 6,648 claims adding up to $453.7 million (previous estimate: $352.6 million from approximately 4,300 claims). The High Park Fire insured loss estimate now stands at $113.7 million from approximately 1,293 homeowner and auto claims (previous estimate: $97.1 million from approximately 850 claims).